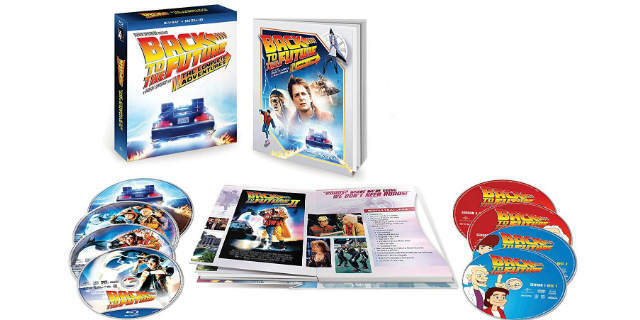 Back to the Future Trilogy [Blu-ray] + Digital HD Only $19.99 Shipped! Back to the Future Sale! Calling all readers! Head to Amazon.com and purchase this Back to the Future The Complete Adventures Blu-ray + Digital HD Set on sale for $19.99, normally $49.98! You will not want to miss out on this great deal. This ultimate Back to the Future collection includes the Back to the Future Blu-ray, Back to the Future Part II Blu-ray, Back to the Future Part III Blu-ray, Back to the Future: The Complete Animated Series DVD (26 episodes), Bonus Disc and a 64-Page Book. Believe me, you will not want to miss out on this great savings opportunity. Let us know what online deals you’ve found lately, because we love to hear from our readers. Check out all of our Online deals! Previous article$1.50 Stocking Stuffers at Ulta Beauty!